Ah, that warm glow. So romantic and comforting, yet the only time my home is filled with candlelight is during a dinner party or a special occasion. I would love to have lots of candles around for the wedding but since we will not be having a sit down dinner, I am not sure where we will place them to play them up. I thought this picture of the lanterns hanging from the trees or on stakes in the grass was so enchanting. 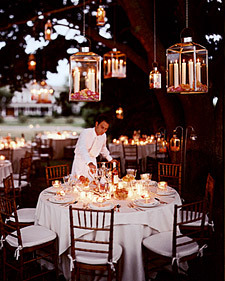 This entry was posted in Flowers & Decorations and tagged Candles, dinner at dusk, lanterns, martha stewart, weddings. Bookmark the permalink.